Atomic Lilly Ranch: I should be reading The Scarlet Letter. I'm stalling. I should be reading The Scarlet Letter. I'm stalling. I promise, I'll take basement bedroom photos on Wednesday. I keep meaning to, then missing daylight. The floors are GORGEOUS. Now if we could just keep the stupid bugs out of there... I finished the trim in both rooms, so the very last part of painting will be touching up some spots in Justin's room. The roller with the white floor paint splattered a little on the bottom portions of the blue walls. And I may or may not have dropped a huge glob down one part of the wall when I was touching up the window trim. Oops. 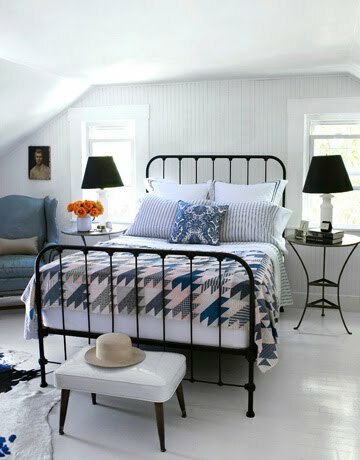 The gray in the guest bedroom needs SO much touching up, but we ran out of it, and the big stupid Home Depot is no longer carrying Ralph Lauren paint colors. We could try to get it matched in another brand of paint, but I'm worried it would look bizarre. We did get the bed all put in the guest bedroom. We just need to put the sheets, etc. on it. It's a little awkward because the room is an awkward shape, but we can always move it if we figure out a better configuration. We're both just really happy to have a guest bedroom! Some day we'll redo the bathroom down there (mainly a lipstick on a pig kind of job I think) and fix up the kitchen, too. We have dreams of setting up a sweet little bar area in that basement kitchen. And who doesn't love having a back up fridge??? We already have a stove and microwave and dishwasher waiting to be installed down there. My dad and stepmom passed them to us when they moved. Oh, so much work... But I love the idea that we are building (hopefully) equity on our own. We'll someday have to have professional help with the bigger projects, like the upstairs bath and the kitchen, but I'm trying to convince Justin that I could teach myself how to tile and redo the floors in our upstairs bathroom. I'm not succeeding. The new project I have urgently waiting for attention is spray-painting a bed frame for our new bed. Our old bed was a lovely wooden bed from Justin's Dad. It's a double, and will live on forever in the basement bedroom as the guest bed. When we got our new mattress (a queen) we bought a bed frame from Costco (thanks Mom) but we can't afford a headboard and footboard. Did you guys know how expensive that business is??? Bananas. 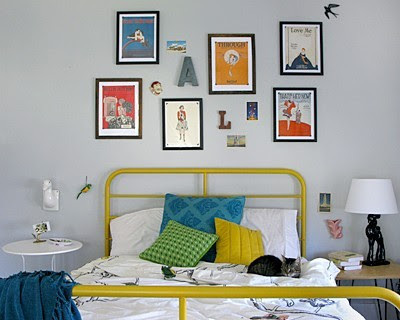 I've been reading up on lots and lots of blogs about DIY headboards (Quirky Delight, I'm looking at you) but I just don't have it in me to scour for beds at the thrift stores. And a lot of my favorite thrift stores have been getting CRAZY expensive lately. Boo. 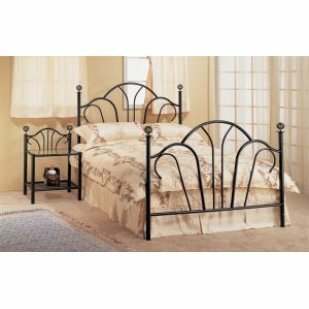 So when my boss said she had a black iron canopy bed that we could have for free, I jumped at it. I assumed we wouldn't use the canopy part, but the finnials that fit on without the canopy attachment are SO early 90's that I might try to just test what the canopy would look like. In my mind, I thought the black iron bed would be like this gorgeous Country Living example, which is not altogether our taste, but is so classic and gorgeous, you just can't not like it. Sorry, that photo is kind of tiny. But you get the idea. In any case, I have no guilt whatsoever about my plan to spraypaint it red. I have the spraypaint, as well as the gun attachment for the spray bottles. I learned my lesson with Roxanne's dresser about spraypaint finger and the globs that can happen as a result. It can get ugly. We were originally planning to just not use a headboard/footboard for a while, but the bed scoots around a lot, and Roxanne has figured this out. She likes to push it around a little (when she thinks we aren't looking) and if you bump into it after a middle of the night bathroom break, you will scoot it a foot or two. When discussing the paint color for the bed, Justin and I agreed that a bright color would be best, to break up the white blob that our all white curtains and all white bed were forming. I wanted orange, but HD only had one can of the Pumpkin Orange spray paint. Jerks. And yellow just seems a little overdone for right now. The red will hopefully be pretty though. And detract from the datedness of the bed.